Yasemin Kenaroğlu founded Kenaroğlu Intellectual Property in 2008. She has been registered at the Istanbul Bar Association since 2003 as a litigator qualified to represent clients before the first-instance and intermediate courts of appeal throughout Turkey and the Supreme Courts in Ankara. She completed her LLM at Istanbul Bilgi University in 2007, writing her thesis on compulsory licensing in Turkish patent law. 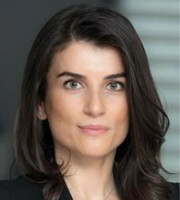 Ms Kenaroğlu specialises in patent litigation and life sciences, and has been advising top-tier multinational companies in the pharmaceutical, electronic, software and automotive fields in a wide range of contentious and non-contentious matters, including patent litigation from infringement to invalidity and declaratory actions. Her practice in the field of life sciences is mainly focused on licensing and data exclusivity issues. Ms Kenaroğlu qualified as a trademark and patent attorney in 2005 and represents clients before the Turkish Patent Office and has been actively advising her clients in administrative proceedings, including filing, prosecution, oppositions and appeals. Ms Kenaroğlu is an active member of the International Association for the Protection of Intellectual Property, the International Trademark Association, the European Communities Trademark Association, the Association of the International Federation of Intellectual Property Attorneys, the Pharmaceutical Trademarks Group and the Licensing Executives Society. She frequently speaks at domestic and international IP conferences in her fields of expertise.